Cleaner/Glaze. Part of the Body Shop line designed for fresh paints. 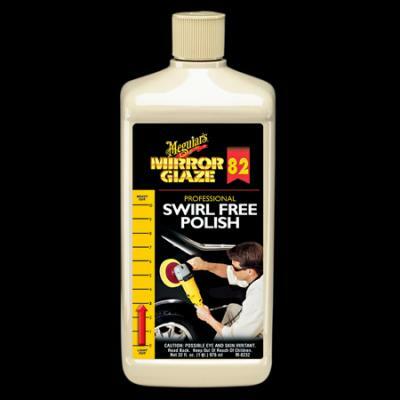 A machine-applied Cleaner Glaze/Polish intended to remove compounding, pad and swirl marks. Matched to Meguiars Compounds and suffieicient to take out the finer marks that they leave behind compared to mor etraditional compounds. A final step on fresh paints which must be allowed to dry out for 45 to 60 days before waxing. An aggresstion level of 3 (of 10). Use with a medium grade foam pad. Swirl Free Polish is a high performance polish that eliminates swirl marks fast. Specially blended polish with cleaning power removes fine scratches. Smooth, fast application and easy wipe-off. Restores a glistening "new paint" shine.